Michelangelo’s Last Judgment is a composition so full of incidents inconsistent with orthdox theology that experts often have trouble explaining them. 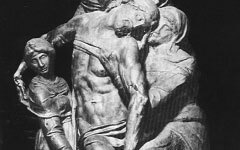 One such detail is the figure of Saint Sebastian who, according to legend, was executed by bow and arrow. 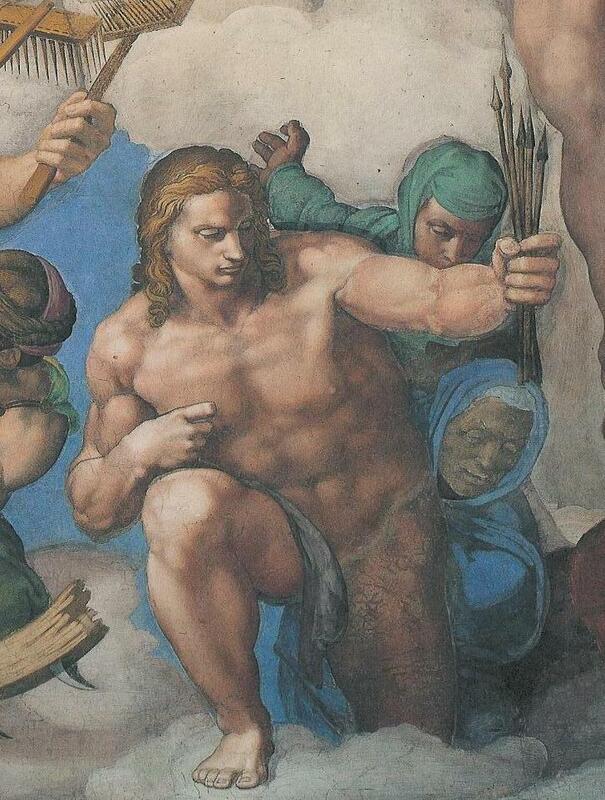 Why then did Michelangelo pose the saint as though he was his own executioner about to pull an invisible bow-string while holding the arrows that killed him? The answer is quite simple. While saints often hold the weapons that killed them as their identifying signs (“attributes”), they are rarely posed as though they were their own executioner as well. 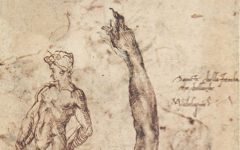 Michelangelo’s Saint Sebastian is. He is a painter, a self-representation of the artist, holding his arrows like an artist holds a fistful of paintbrushes. A poetic painter would recognize the metaphor immediately because they too hold brushes like that in the studio. Those on the right are from a 1951 Self-Portrait by Frida Kahlo and, even without explicit reference to Michelangelo, her brushes drip with blood. Brushes are so important to a painter's ability to depict their inner world that they are often represented by weapons that pierce the body to reveal blood, a common symbol for paint. The brush's symbol is particularly appropriate when, like an arrow, it is long, thin, tipped and made of wood. 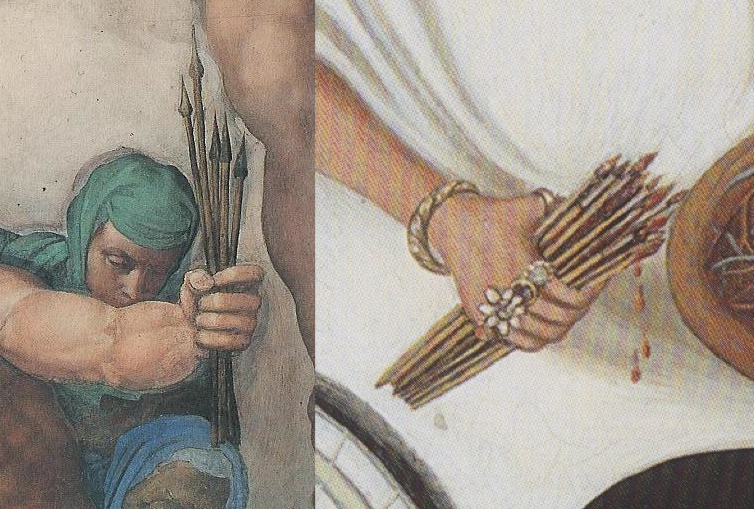 Now that the arrows are recognized as brushes, St. Sebastian's archer-like pose makes sense for the first time. He is his own executioner because “every painter paints himself”. 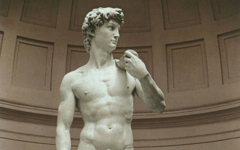 Other artists have indicated their alter ego in both archer and saint (as artist and model) to convey the same message; Michelangelo did so more concisely in the saint alone. For Saint Sebastians by other artists, see two examples by Mantegna and one each by Durer, Hans Baldung Grien, Perugino, Carlo Crivelli, Barrocci, Egon Schiele and a lesser-known artist, Antonio Campi. Original Publication Date on EPPH: 20 Apr 2010. © Simon Abrahams. Articles on this site are the copyright of Simon Abrahams. To use copyrighted material in print or other media for purposes beyond 'fair use', you must obtain permission from the copyright owner. Websites may link to this page without permission (please do) but may not reproduce the material on their own site without crediting Simon Abrahams and EPPH.